Save time - Save money - Join the Farbrengen Club. Save 10% and receive FREE SHIPPING* every time a new Farbrengen video is released. 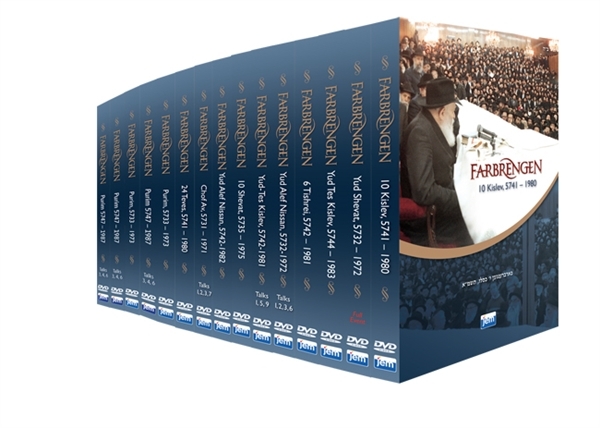 Regular Farbrengen DVD price = $24.95, Farbrengen club members only pay $22.46! Farbrengen Club members automatically receive all new Farbrengen videos, as soon as they are released, at a 10% discount plus FREE US SHIPPING*. RISK FREE return option: If you receive a video that you don't want just send it back and we'll refund your full purchase price minus $3 to cover our shipping costs (International: $12). Once you join Farbrengen Club just sit back, relax and know that you will be getting the best possible price on all new Farbrengen DVDs from JEM, automatically! To join, just add Farbrengen Club to your cart. *International members pay a reduced shipping rate of only $6. Discount applies only to videos released after the date your membership is activated. Farbrengen Club purchases are shipped to the address specified in the membership application. To update your shipping address in the future, send an email to membership@jemedia.org. Farbrengen Club membership applies to new releases only and does not entitle you to any discount on JemStore.com purchases. Please allow up to 48 hours to activate your membership. JEM's Farbrengen Club is amazing! Throughout the year I get Farbrengens delivered to my door! This is a perfect way to "live with the times". You get an inspiring farbrengen from the Rebbe practically live. Every talk, every niggun, every L'Chaim. It is truly a great DVD series. And when you subscribe to receive them on a regular basis, you even get a nice discount and free shipping. It has done wonders for my hiskashrus.